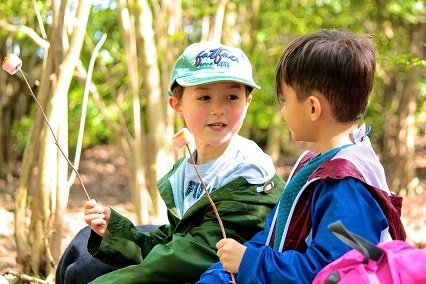 Den building, foraging, pond-dipping, spotting wildlife, adventure stories, creative arts…. spending time in the countryside can be so much fun! Yet, sadly, so many young people have no experience of this. The benefits of spending time outdoors are well documented and as part of our work on Health & Wellbeing over the last couple of years, the AONB Team has set up the Wild! project and has so far organised a number of outdoor learning events for young children and their families and worked with children from local primary schools to encourage them to come and have fun and enjoy the AONB. Woodland Fun Days to learn all about bushcraft; Land Art sessions to create some spectacular artwork with nature’s materials; Days on Warton Crag in search of butterflies that make their home there; all events have been really well received. With funding from Heritage Lottery Awards for All, we have also been able to work with children from two primary schools – one within the AONB and one city school – by welcoming them to the ‘outdoor classroom’ and helping them discover lots about the birds of the AONB. They then followed this up by working with an artist in residence to create some wonderful artwork and poetry. We are now looking to develop the project further by recruiting volunteers who are particularly keen to work with the children to pass on their own skills and knowledge of the outdoors and, eventually, to provide an online library of suggested activities to do in the outdoors so that families feel equipped to do their own activities on a more spur of the moment basis having built an affinity for being outdoors through the project. If you would like to volunteer or just to know a bit more about the project, please contact the AONB office on 01524 761034.